However the corresponding Activity Diagram in Figure 9.20 doesn't show the "via pp" string, that would signify that this port is to be used for the call. The notation for the Pins is wrong: They are shown as filled squares, which would mean, that they are referring to streaming Parameters. The ports are listed in the compartment for attributes. While this is allowed, it is unusual. It would be better to show the ports as squares. At least the conjugated port should show a "~" (this is not defined for attributes, but when a port is shown as attribute, it should also use the port's notation). The tooling used for the diagram in Figure 9.18 does not put receptions and operations in different compartments. 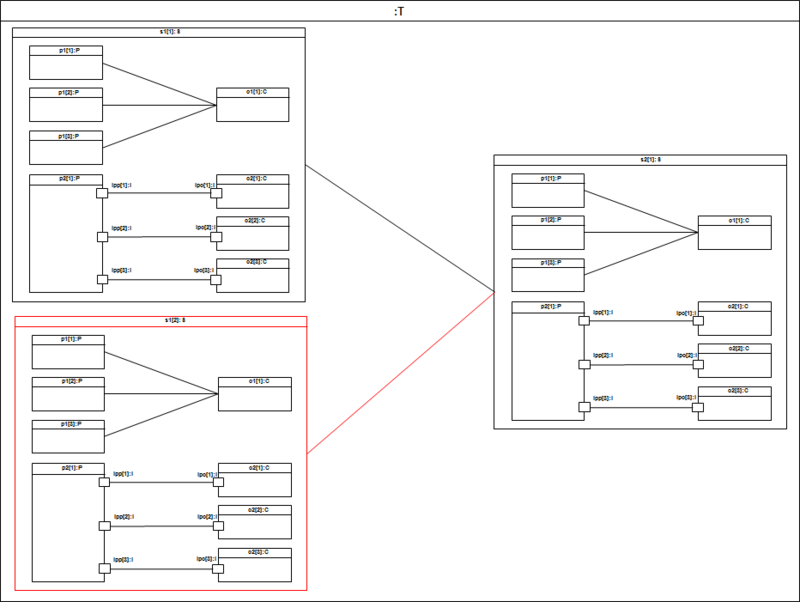 Receptions and operations also appear together on other class diagrams in Clause 9. Nevertheless, it is still clear what is being specified as a reception and what is being specified as an operation. Therefore, it is not worth manually correcting Figure 9.18 in a way that would be inconsistent with other existing diagrams, or trying to update all diagrams where this occurs. In general, the overview class diagrams for test cases in Clause 9 do not show ports at all. These are only shown on the internal structure diagrams. Therefore, it is sufficient to simply remove the port declarations from Figure 9.18, since they are shown on Figure 9.19. The PSSM syntax is a subset of the UML 2.5.1 abstract syntax metamodel, and the required functionality formalized in PSSM is taken from that specified in UML 2.5.1. However, PSSM is also semantically based on fUML and PSCS. But the current versions of these standards, fUML 1.2.1 and PSCS 1.0 are based on UML 2.4. In order to avoid inconsistency, particularly given the sweeping reorganization of the UML abstract syntax metamodel adopted in UML 2.5, the fUML and PSCS syntax and semantics models have been migrated to UML 2.5.1 for use with PSSM, but with no change to their functionality. In addition, the fUML and PSCS models have been updated to use an approach for identifying and constraining their syntax subsets that is consistent with that used in PSSM. In adopting this specification, the PSCS RTF was directed to update the PSCS specification consistent with the migration of fUML syntax and semantics models top UML 2.5.1. Since the adoption of PSSM, PSCS 1.1 has been approved as the current version of PSCS, so the PSCS 1.2 RTF now needs to carry out the migration of PSCS 1.1 to UML 2.5.1 for PSCS 1.2. Remove subclause 2.2 on conformance levels. Update the normative references to UML 2.5.1 and fUML 1.4 and remove any references to the infrastructure/superstructure separation..
Update subclause 6.1 Changes to Adopted Specifications to remove the reference to UML 2.4.1..
Update Clause 7 Abstract Syntax to reflect the UML 2.5.1 package structure and the new approach for specifying the PSCS abstract syntax subset. Update Clause 8 Semantics to reflect the UML 2.5.1 package structure. The normative syntax and semantics XMI also need to be updated to reflect the new approach for specifying the abstract syntax subset and for the UML 2.5 reorganization. Figure 9.66 was exported with tool focus which looks odd in the specification document. In addition, this figure looks hard to read due to the small font size.